So apparently all you have to do is jam up Patriots tight end Rob Gronkowski. Boom, case closed. He's no better than Heath Miller or you've average tight end. Obviously this isn't true, but the Steelers seemed to be belittling the All Pro tight ends' ability on the football field. Second year linebacker for Pittsburgh Ryan Shazier point out to Jeremy Fowler of ESPN how his team plans to slow down Gronk. "You just have to jam him up a little bit, mess with his timing," Shazier said. "If you mess up their timing, they are really time-oriented. You have to mess up their timing and get in his face with pressure, then I feel we can slow him down a little bit." Shazier wasn't the only Steeler talking about shutting down the Pats main red zone threat. Safety Mike Mitchell doubled down on Shazier's comments about Gronkowski. "He has success when people don't put their hands on him," Mitchell said. Both players did talk about how good Gronkowski is, but it was clearly more of a backhanded compliment than anything else. The former Arizona product didn't bite however, giving the generic Belichickian answer. 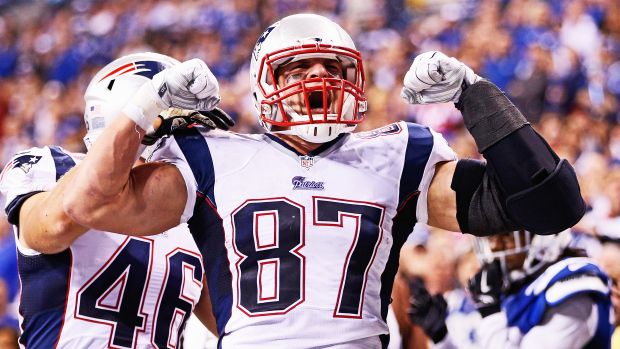 "Some games I get jammed the whole game, some games I never get jammed," Gronkowski said. "So when we go out there and practice, we practice everything -- getting jammed, not getting jammed, how to get off it, a little move. Whatever comes, I have to be ready, go out and perform." He is saying all the right things publicly, but you know he is foaming at the mouth to get on the field Thursday. He better have "Can't Touch This" by MC Hammer queued up if he scores a touchdown. I think the Steelers would just have to go home after that. No idea how they'd recover to Gronk jamming out to that number.